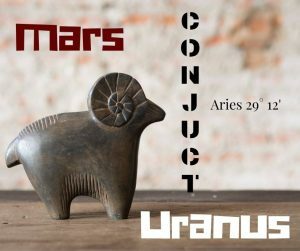 Mars will conjoin Uranus at the anaretic degree (29°) on the 13th on February. Both planets are pushing to express their Aries qualities to the fullest. It’s a turn-around point with a sense of transition to it. These two planets together have a very explosive nature and even more so being in Aries, the lets-do-it-my-way sign par excellence. So, if you have planets in the very late degrees of the Cardinal signs be prepared for some rash behaviour and surprises. First time visitor to your website i am so impressed reading your blog. Thankyou Pavan, I am so happy that you enjoy my writings!